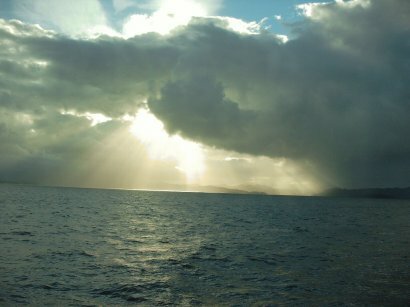 The sun breaks through the clouds in a fjord in Chile. (Click on image for full size photo). November 4 - 22, 2003. Lots of News & Cruising. We got some great news this week. First, we are going to perform The Big Voice for the General Conference of the Unitarian Universalist churches in Long Beach, California at the end of June. This is a great opportunity for us to reach new audiences and to spread the inspiration around! I'm really happy. Thanks to our friends in Houston at First UU there who sponsored us. Second, I'm going to be interviewed by the BBC next week for a broadcast around World AIDS Day. It's a show called Talking Point and the producer Mark Savage seems like a really great guy. I'm not sure if it's going to be web broadcast but I'll try to find out soon. Thirdly, a new book "Virtual Miracles", 40 True Stories of Love, Courage and the Amazing Kindness of Strangers by Karen Derrico, features this site and the story of how "connected" so many people have become as a result of the Bonus Round diary. I feel very privileged to be a part of this book. If you enjoy reading inspirational stories of real people doing real miracles using the Internet, I highly recommend this book. 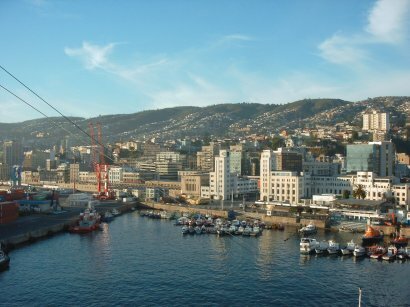 I haven't been on the Internet very much because for the past two weeks, we've been on another cruise. It was a last minute call by the cruise line begging Jimmy to deliver his lectures on Lucy and Ethel (among others). He's become one of their most popular lecturers. And it's really great for us because money, being tight these days (as usual), it's actually cheaper for us to go and let someone else feed us than it is to stay home and buy groceries here in La La Land. 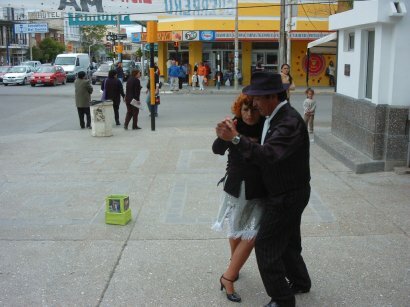 The cruise was a cruise around Cape Horn through the Straits of Magellan. There were some magnificent sights, to say the least. 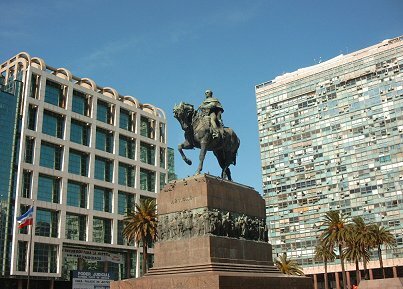 Close-up of building in Montevideo. 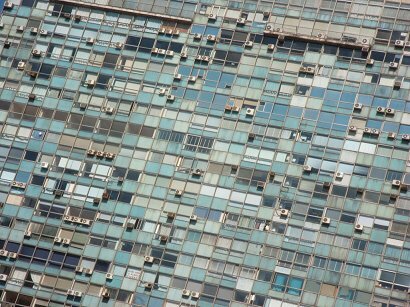 (click on image to see full-sized photo, my new desktop). 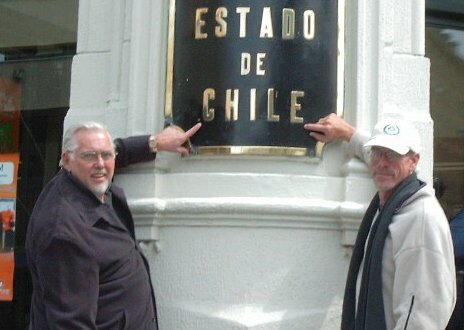 Steve and Jim in Chile. Yes, I've grown a goatee and mustache. 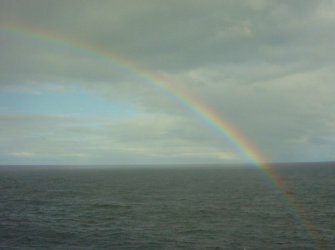 A rainbow on the open sea. At night, the entire hillside was lit up. Absolutely beautiful. Sunday night is our big night. 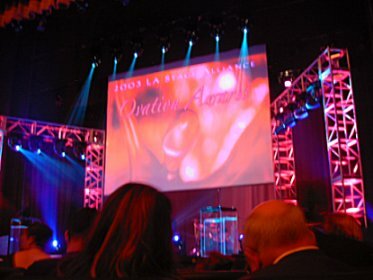 The Ovation Awards ceremonies. 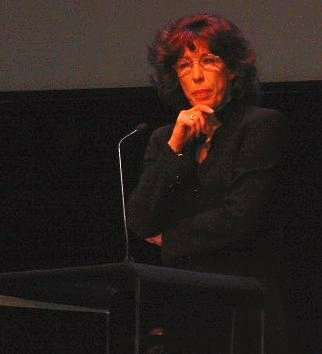 Lily Tomlin is the host. We are so excited. And we really want to win! So keep your fingers crossed for us. I'll let you know the full story whichever way it goes. Truth is, I think our show was "too small" to really win such big awards here in Los Angeles, so we were just thrilled to be nominated, but you never know! Finally, we got good work done on the new musical, which is what I spent the vast majority of my time doing while on the cruise. I found a little piano in a bar and got up at 3am each morning, working through the night. I also finished -- FINALLY! -- writing out the full score for The Big Voice. Now it's all done and on paper at last. I wish I could report that we won Ovation Awards last night, but unfortunately we did not. However, there was controversy surrounding the winner! 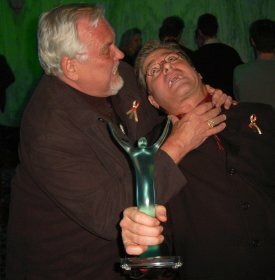 So, like any good Hollywood plot, we got to whisper in the alley afterward that we wuz robbed! You see, it looked so promising. They sat us down close, on the aisle, near some stairs to the stage. We were just SURE it was a good sign. In fact, Marie Cain (whose name was spelled "Marie Lain" in the program) looked over at me at the same time Jimmy did and both of them said, "It's a good sign!" I wanted it so badly. I admit it. I mean, you're there. You're all dressed up. Lily Tomlin is on stage cracking hilarious jokes. Jim & Steve so full of hope! So nervous! 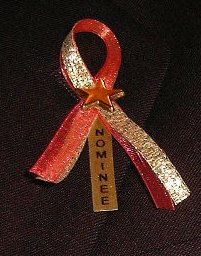 They give you a nominee ribbon. 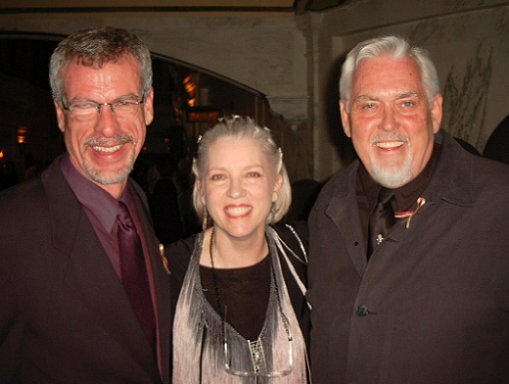 Steve, Marie "Lain" Cain, Jim. 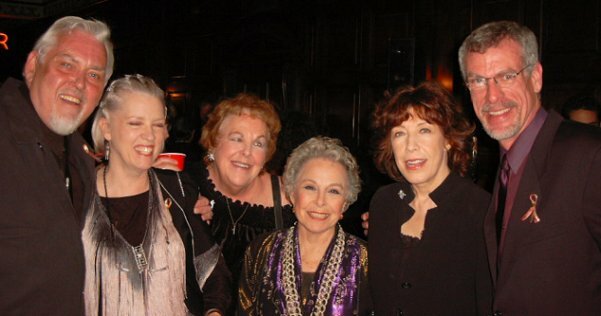 legendary dancer Marge Champion, Lily Tomlin, Steve Schalchlin. Suddenly, it's time for the show! Best Actor In A Musical! They flash Jimmy's picture up on the screen! It's so big! He looks so good! Playwright George Furth says his name. Jimmy grabs my knee and says, "I'm getting nauseous." When George says "The Big Voice: God or Merman?" the whole audience laughs! It feels good. But he's up against big productions! Big stars! And the winner is David Engel for "Crazy For You." (We are friends with David, so we were happy for him but still, he won in this category last year in the same role, different theatre -- even David thought it was a little weird). Jimmy congratulating David Engel afterwards. Then it's Best World Premiere Musical. You're up against two "Judy" shows, both of which have garnered awards already, one for musical direction ("Songs My Mother Taught Me") and one for Best Actress in a Musical (Champagne as Judy Garland in "Judy's Scary Little Christmas"). "Songs My Mother Taught Me". The show Lorna Luft did celebrating her relationship with Judy Garland, her mother. Bitter? I'm not bitter! But it did feel like all the air went out of my balloon. Anthony Barnao sitting next to me patted me on the shoulder. I put my head on Jimmy's arm and felt sad for a moment. I tried so hard going into this to convince myself that we wouldn't win so that I wouldn't feel let down, but I really felt we had a shot. Truth. I'm a big phony. I really wanted it. Afterwards, however, was when the controversy started. 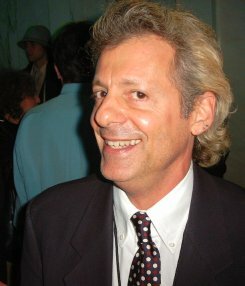 You see, LA Times writer Don Shirley had previously written that the award nomination made no sense, that "Songs My Mother Taught Me" had already played 28 cities. 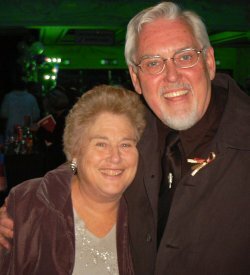 Others said that it wasn't really a musical, but a cabaret show with Judy's daughter singing Judy songs. I didn't know. I didn't see it. Suddenly, Jimmy says, "Here! Ask Steve what he thinks!" 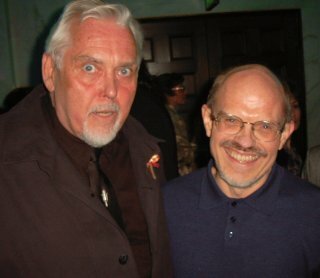 Jimmy with Don Shirley of the L.A. Times. It was the aforementioned Don Shirley wanting to know what I thought of "the controversy." I'm sure I probably said something stupid, but it went like this. I said, "I didn't see 'Songs My Mother Taught Me' but if it played in 28 cities already, then it's frustrating for those who were actually nominated with world premiere shows." I know those weren't my exact words, but yeah, why call something world premiere if it isn't a world premiere? Then I said, "But still, LA Stage Alliance deserves credit for nominating a show like ours which had no budget, no marketing, no outside producer, etc. That we were found amidst all the big money shows says that they do really care about finding good shows, not just famous ones." (And in fact, The Producers, which swept the Tony Awards won nothing in Los Angeles). So, what can I say? After the initial blow and the real let-down of not winning the Ovations, we started to feel a bit peppier. But then came the two great moments of the night. First, Ken Werther, the best (and best connected) theatrical publicity agent in Los Angeles came up and told us that the next time we play Los Angeles, he'd donate his services to us for free. 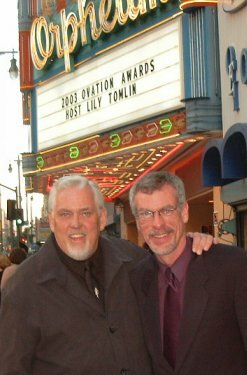 He works for the big Ahmanson Theatre and had just finished working with Lily Tomlin and a lot of other bigshots. It's incredible to have someone like Kenny in your corner. Our time in LA might not be over just yet. And then, my favorite moment of the night: An older woman came up to me with food in one hand and Coke in the other, "Are you Steve Schalchlin?" "I just want you to know that I loved 'The Big Voice' and I've been playing it all day long. I still cry during some of your songs. My husband said to me, 'What are you crying for? You've already heard these songs.' " Then she asked me if the cast album of The Last Session was still available. I told her it was. So, thank you Janet. Your sweet smile and wonderful words meant more to me than I can tell you. Janet and Jimmy share a hug. As Jimmy says in The Big Voice, we never know the effect we truly have on each others's lives. There was Janet out there all this time being affected by our music -- and here she was this night giving us just the little boost we needed after a long, emotionally disappointing night. On the ride home, Jimmy said, "Do you think you said anything controversial to Don Shirley? Will it get into the paper?" I panicked for a moment, picturing a sweeping headline, "Schalchlin Slams Ovations!" Oh well, as they say in Hollywood, baby, there's no such thing as bad publicity. And we have a show to sell!